Jeb Bush and his Foundation for Excellence in Education have been one of the loudest proponents on Common Core. 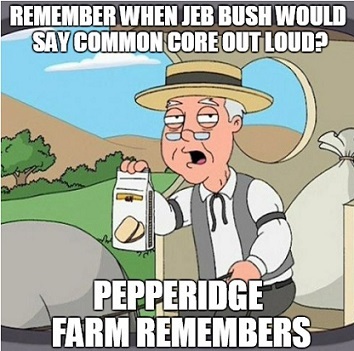 Now Bush is running for president, headed to Iowa soon and he’s going silent on Common Core. Hoping voters forget? Not gonna happen. Bush made statements about the testing and about opposing Federal involvement. This is pure double-speak. SBAC and PARCC are the Common Core tests and they are indeed assessments done ‘in a certain way’ as chosen and directed by the U.S. Department of Education. “I’m against the federal government being involved in demanding that assessments are done in a certain way,” he added. “No,” he responded after an educational summit headlined by the former governor headlined here. This entry was posted in Common Core, ELECTIONS and tagged Election 2016, Jeb Bush, PARCC, SBAC. Bookmark the permalink. 1 Response to Jeb Quits Saying ‘Common Core’. Hopes Parents Forget?